This is your FIRST step on a journey that will take you places in training your dog that you never knew were possible! We offer several Title Competitions, and over 80 Merit Badges that you and your dog can earn together. But in order to do any of those, you both must pass the Dog Scout Test first. The dog is tested on several basic skills that show manners, obedience, and safe interactions. The handler is tested on their knowledge of training, and of basic DSA beliefs and methods. It is not easy to get, but once completed, you will have built a foundation of skills that will carry your dog throughout his life. Learning and earning the other items is then icing on the cake! 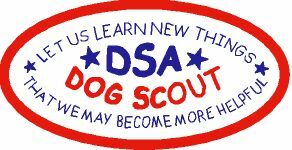 Please remember that, although you MAY work on criteria for any badges you wish at any time, you will NOT be able to actually receive the official recognition for that badge until after you have successfully completed the Dog Scout title.